Home » Carpenter Bus Blog » You Won’t Believe These Bus Safety Features!! 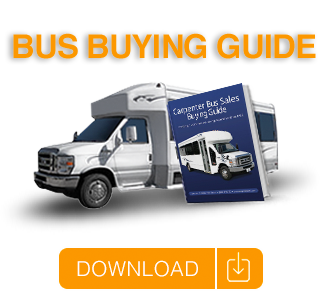 At Carpenter Bus Sales, the safety of the passengers when buying a bus is the primary focus. We take the safety of your passengers very seriously as we view them as our passengers as well. The construction of a bus is the heart and foundation of the bus. Not all buses are created equally. Some buses are built entirely with fiberglass shells while others come with steel cage construction. With a fully-welded steel structure, the buses from Carpenter Bus Sales offer the best in passenger protection. Besides sound body construction, there is a multitude of interior safety features that are offered on buses. First of all, Altro™ safety flooring, a flooring choice preferred by most of our customers, is an option that is slip resistant and easy to clean. Another great safety feature is the grab entrance rail. Upon entering a bus, having a hand rail is a great feature that helps those who need to be able to get onto the bus with assistance. All of our buses come with at least one grab entrance rail while most of our buses come with grab entrance rails on both sides on the steps. Next seat belts and lap belts are standard features on all new buses sold at Carpenter Bus Sales. This enhances the safety of all passengers onboard. In addition, Carpenter Bus Sales offers an interior lighting system that helps maintain the safety of passengers during evening and increment weather conditions. Along with interior safety features, Carpenter Bus Sales offers exterior features that not only enhance the look of the bus, but also reinforces the safety of the passengers. One of these features is the ultra bright LED tail lights. These lights help your bus be seen from longer distances than standard or conventional lights. Exterior reflective decals and striping also make the bus visible to traffic and passengers. Additionally, all-wheel disc brakes have been our standard for years, increasing the safety of passengers as well as drivers. Your safety, as well as the safety of your passengers is paramount to Carpenter Bus Sales. New buses are put through rigorous testing and a quality assurance process. We have a commitment to quality, durability, and value. To learn more about other safety features, please contact us today at 800-370-6180.